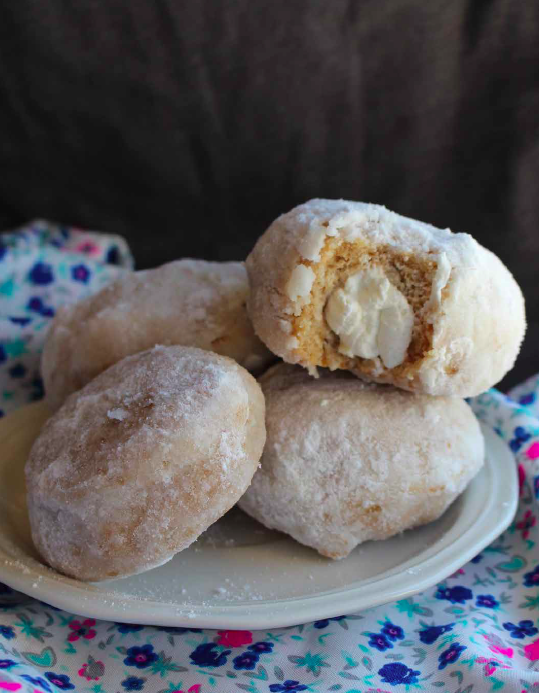 Who doesn’t like light and fluffy cream filled donuts?! Well…These really are just that! This donut recipe will be released in my new cookbook, but I couldn’t wait to share it with you, especially with the holidays coming up! Warm, yeast donuts are some of my favorite treats, but sugar-filled ones always make me sick. Although the cream in these donuts makes these a crossover, they are perfect for special occasions. I often make glazed ones as well. These donuts are made with a sour dough starter, but do not taste sour at all–thanks to the baking soda. In a large bowl, mix all ingredients EXCEPT the baking soda. (Keep metal away from sourdough starter.) Place on a greased counter and knead for 15 minutes. (This knead time is important because even 5 minutes can make a big difference in the airiness of your donuts.) Place the dough back into a lightly greased plastic bowl. Cover with plastic wrap and let it rise for 7 hours. Sprinkle the baking soda over the dough. Use your hands to incorporate it until it's mixed in WELL. On a lightly floured surface, (use sprouted flour to keep it THM compatible) shape into donuts and let them rise for another 15-30 min. Fry in oil for several minutes on both sides until they're done in the center. I recommend frying only one or two and then checking for doneness before frying all of them. Let them cool on paper towel or paper bag. Whip up all the ingredients until desired consistency. Just before serving, fill with filling. With a straw, make a small hole on opposite sides of the donuts. Pipe the cream filling in both sides until the tops begin to split. Roll in powdered sweetener. *Prep Notes: This is the amount of flour I use, but if your starter is runny, you may have to use a bit more. It’s important to remove refrigerated starter the day before and feed it 3 times (at room temperature) and then again 4 hours before you use it. This will make sure your starter is active and at its peak, with less of a sour taste.